Lucy tells us about the importance of gaining hands-on experience and how her placements in Cornwall, Devon, and Finland have helped her as a teacher. I started my first teaching position as a Nursery Teacher, and have just recently completed my NQT year (Newly Qualified Teacher). My degree has enabled me to work as a teacher and the experiences I gained from studying at Plymouth University have supported me in my daily routine as a class teacher. Balancing my workload, because although whilst I was on my placements there was a fixed duration for the paperwork to be completed, as the class teacher it is continuous and can quickly build up! To support a theme of The Very Hungry Caterpillar, we looked after baby caterpillars and watched them develop through their life-cycle into butterflies. There was so much excitement as the children watched the butterflies hatch from the cocoon; then, within ten minutes, there was another one! I would learn to prioritise tasks sooner, identifying which were of higher priority or needed further consideration. This would probably have helped to balance my workload better! To experience life in the classroom and to talk to teachers – any advice is helpful, especially the practical classroom tips! Studying at Plymouth University provided me with a wealth of experience in schools and how to handle different teaching scenarios. I learnt from experienced lecturers and I was able to develop my confidence and skill to be a class teacher. I learnt how to express myself effectively as a class teacher through the different placements and challenges I faced (teaching in year two was rather daunting!). As a result of these experiences, I was able to reflect and progress as a teacher. I undertook several placements within Cornwall, Devon, and Finland. 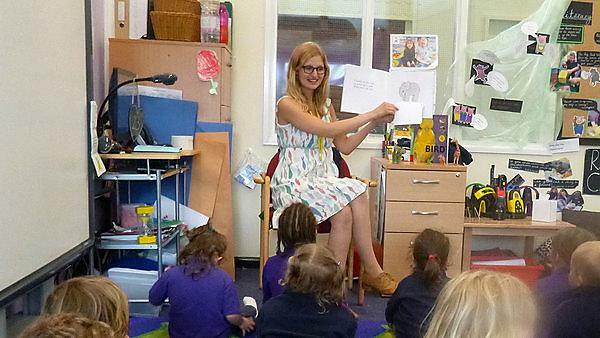 The variety of experiences helped to develop my teaching ability and is something that has been praised by employers. My most memorable one would be in Finland, because teaching a class of children who could not speak English was certainly a challenge! I learnt so much in the school by being immersed in a different culture. It was truly unforgettable. I would have to say going to the Hoe for a barbecue in the spring and summer. Being able to hang out with friends and have fun so close to campus was great, even with the occasional icy swim in the sea! Yes, I am in touch with alumni who were on my course as well as others from Plymouth Storm Cheerleaders. It is particularly helpful to share current experiences with other teaching graduates, such as topic ideas or any tricky situations we may experience as a class teacher. Yes, it is an incredible city to live in as a student. I fell in love with Plymouth, both as a city and as a university. My parents met during their studies at Plymouth, and I never quite believed how amazing it was until I experienced it myself. For more information about studying BEd Primary (Early Childhood Studies), please visit our BEd (Hons) Primary (Early Childhood Studies) course page. For more information about our range of courses within the Plymouth Institute of Education, please visit the school page.